This morning, Brazilian TV Globo will show the last episode of its excellent 4-part documentary to commemorate 20 years without Ayrton Senna. It is centred on that dreadful Imola weekend and the few days that followed. I went to Imola for the first time in 20 years for this programme last January. I offered to go and paid for my tickets. I wanted/needed to be there. I thought it was time to come to terms with it all. I hardly slept the night before. I was agitated on the flight over and physically shaking when I got there. I knew it would not be easy but I am a very pragmatic person and thought I’d be ok. After all, I don’t really need 1st of May to mourn Ayrton Senna or look at one of his photos to remember him. But that Imola track played a trick on me. All the memories came flashing back and I did end up crying which I swore to myself I wouldn’t. The producer Ernesto Rodrigues and his crew were already there, interviewing one of the men who were in the safety car in which Ayrton took a lift to Ratzemberger’s accident spot. I went around the track with them, stopped at Tamburello. Unfortunately, the programme is in Portuguese only. But I will add the video link later. For the time being I would like to recall an episode – which I make public for the first time for this programme – that struck me hard then. Most of us – close friends, family, international guests – flown by helicopter from the state wake at the National Assembly in São Paulo to the Cemetery. I had helped to show people to their flights and had to juggle requests of the most varied types; including people who refused to ride in the same helicopter as this driver or that team owner! I could hardly believe my ears – that was not a holiday tour! – but obligingly found them a different ride. After parading the streets of Senna’s home town, lined by hundreds of thousands of people, the fire truck carrying the body reaches the cemetery. Gerhard Berger, Ayrton’s best friend in F1, comes rushing to me. “Betise, Betise. You have to help me. Someone (who shall remain anonymous) told me that Prost (Alain) and Jackie (Stewart) will be the front men carrying the coffin! Apparently it is by order of who has won more World Championships! !You have to change that! They are the 2 people Ayrton hated most; the two who made his life harder!”. He was horrified and, quite frankly, so was I. I felt sick in my stomach. I immediately set out to the task. On the way, I bumped into Geraldo Rodrigues, Rubens Barrichello’s manager and a dear friend.He asked where I was going in such a hurry. “Gê (that’s how I call him), you’ll not believe that. 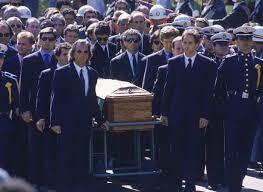 They want to put Jackie Stewart and Alain Prost right in front, carrying the coffin. Ayrton must be rolling in the coffin. Must change that”, I explained and rushed off. After talking to the head of the Fire Brigade I found out that nobody would be carrying the coffin. “As it has been sealed with some extra material, the coffin is extremely heavy and, therefore, not safe to be carried on the shoulders”, I was told. “it will be put on a trolley and rolled along to the spot where it will be buried”. I remember racing to the entrance of the cemetery to get Damon Hill out of the van carrying the Williams’ guests. Frank was white and stunned when I slid the door open and asked Damon out. He was, too!! ” Sorry to be so abrupt but the family would like you, Damon, to be one of the pallbearers”, I lied. In my mind, I wanted to do what I thought Ayrton would have been most satisfied with. He liked Damon. I liked Damon. But the English driver did feel a bit intrusive, I could tell. He hardly knew Ayrton, there had been only three races! I thought it was important to have his team mate there. After that, I went up to where the drivers were gathered together, pretending I knew nothing about the previous arrangements, explained to them that the coffin would be wheeled along and sentenced: “Gerhard, Ayrton’s best friend in motor racing, will be in the front; on the opposite side the most condecorated Brazilian driver, Emerson; behind them we will alternate a foreign and a Brazilian and so on..” I’d like to think Ayrton would have been proud of my taking charge, making an informed decision and acted on it. And I thought that the arrangements would have been easy and, out of respect for Ayrton, everybody would have co-operated, been on their best behaviour and generally got along with each other bearing in mind the gravity of the occasion! Just shows how naïve I am!! At the time, I thought the same about Prost but also realised that he was very respectful and seemed to be (as me) stunned and numbed by the events. Different people had different relationships with Ayrton and grieved and different ways. Maybe Prost thought he HAD to be there. I fully understood that. But that does not mean he should be in the front of the all bearers. He did not ask for that. In the contrary, he was very respectful and followed all instruction I had to give him – unlike other people who refused to be near so and so; get into the helicopter with ‘that’ person…. I too thought all people attending could put differences aside and pay their respect to Ayrton. At the time, I could not believe the Frenchman (Prost) had the audacity to attend. I was 16 when the great man passed, in Australia, watching the race on TV, then reading about the following events in news papers and magazines. This article states “they” wanted Prost and Stewart at the front. May I ask who “they” are?. Some day I will go to visit the resting place of the great Ayrton Senna da Silva.